It’s called the Stamina Air Resistance Cross Trainer, which may sound like some high tech machine, but it’s nothing more than a fancy name for a manual elliptical. While this is a basic, no-frills model, this Stamina is almost guaranteed to give an owner a multitude of frustrations and headaches. 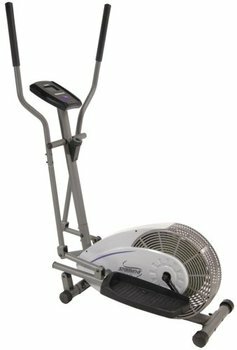 The Stamina Air Resistance Cross Trainer has a multi-function electronic monitor that scans speed, time, distance, and calories burned. UPDATE: The Air Resistance elliptical has been discontinued and replaced with all new models. The Stamina Air Resistance Elliptical Trainer isn’t worth your time or trouble. Equipment experts advise that buying cheap elliptical cross trainers is usually a bad move. They don’t hold up well to daily use, and it’s frustrating to deal with a fitness machine that breaks down early and often. Before long you find that you are out $250 bucks and stuck with a worthless piece of equipment that costs more to repair than replace. Elliptical reviews on this model are brutal. Even though many users reported that their machine (fortunately) broke down during the 90-day warranty period, they still had trouble getting replacement parts from Stamina. The design flaws on the Air Resistance Cross Trainer are numerous including: flimsy construction, pedal arms that fall off due to the bolt that holds the arm to the crank shaft is easily stripped, the trainer doesn’t hold up to riders over 150 lbs, and users were frustrated by poor alignment of parts during assembly. Current users warn would-be owners to spend more money and get a quality machine. At $249, the Stamina Air Resistance Cross Trainer is not recommended for anyone. Even if it didn’t have all the issues with cheap components, it is still too small and too lightweight (13" stride and a wobbly 64 lbs) to do most adults any good. There are several better choices in elliptical trainers even at a budget level. We suggest you review some Weslo and Schwinn machines on this site, and read our discussion on Cheap Elliptical Trainers. However, if you are serious about elliptical training, you should also consider one of the budget NordicTrack Audiostrider machines for under $800. While they are a bit more expensive, you get a solid trainer, plus free shipping and interest-free financing for 6 months.